Visit Vietnam with Uncle Nine! You plan to visit Vietnam? 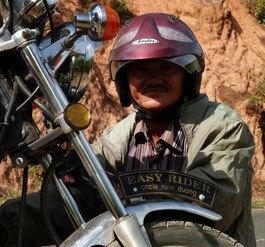 You do not only want to see the tourist places but also meet the "real Vietnam"? You want to eat and drink the local food? You want to try to talk and smile to the minority people of the different ethnics? You wanna see the diverse landscape of central Vietnam? You want to swim in different waterfalls, enjoy the views of passes, wander around ethnic villages? You want to have a private Tour Guide you can ask anything in the world? If you can answer all those questions with a yes, you found the place, here, with Uncle Nine / Duong. A Tourist Guide/ Easy Rider since more than 15 years he is a reliable, honest, trustworthy, funny guy as well as a very safe driver who will do anything, to meet his customers wishes! He can tell you about Vietnams history, wars, cultures, manners. He loves to laugh and is most happy, when his customers wear a smile on their faces.